Almost raw lunch with girls. I made cauliflower pilaf in lettuce cups, topped with falafels and tahini dressing. I also made zucchini noodles with fresh basil and simple maple mustard dressing. Very light and healthy lunch! 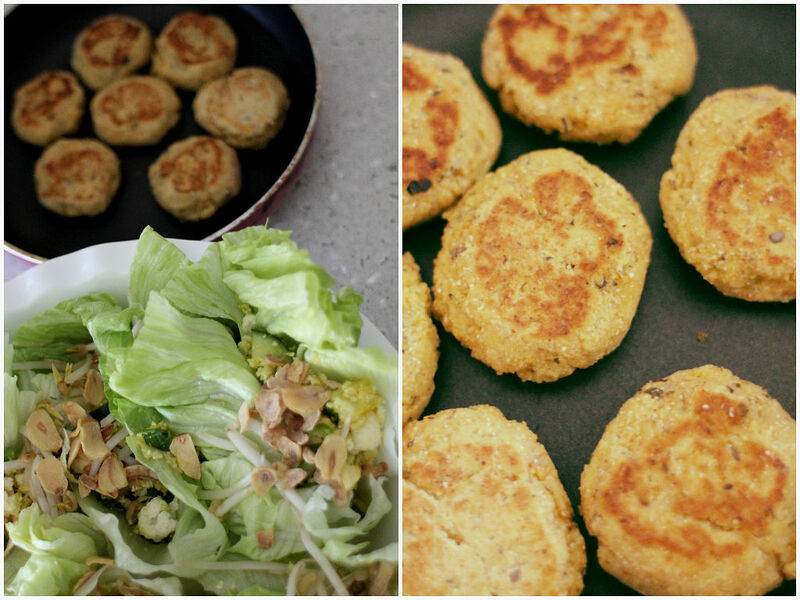 I didn’t have soaked chickpeas to make falafels, so chose to take an easy way using chickpea flour. Falafel is a traditional Middle Eastern food, deep fried balls made of chickpeas or fava beans or both usually served in pita bread. It is great in wraps, sandwiches, salads, or by itself as a snack. When made with chickpeas, falafel is high in protein, complex carbohydrates, and fiber. Chickpeas are also low in fat and salt and contain no cholesterol. Key nutrients are calcium, iron, magnesium, phosphorus, potassium, zinc, copper, manganese, vitamin C, thiamine, pantothenic acid, vitamin B, and folate. Phytochemicals include beta-carotene. To make it healthy, you can bake in the oven or lightly pan-fry with coconut oil like what I did. 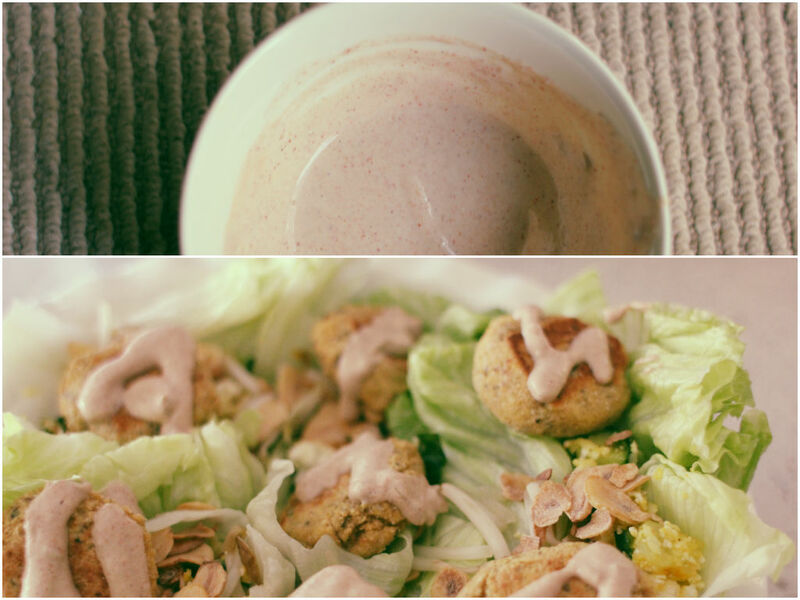 I really like them in refreshing salads with a drizzle of spicy tahini dressing. Yummo! Mix all ingredients in a large bowl and add water little by little until all combined. Cover and rest the dough for 30 minutes. Heat coconut oil in a frying pan over medium heat. Spoon the mixture into a pan or shape with your hands. Pat into little discs. Cook for a couple of minutes each side until cooked. Cook in batches and add more oil if you need. Cut the lettuce leaves into little cups. Mix grated cauliflower rice, chopped vegetables, spices and olive oil in a large bowl. Season with salt and pepper. Spoon the cauliflower rice into the lettuce cups. Garnish with toasted garlic chips. 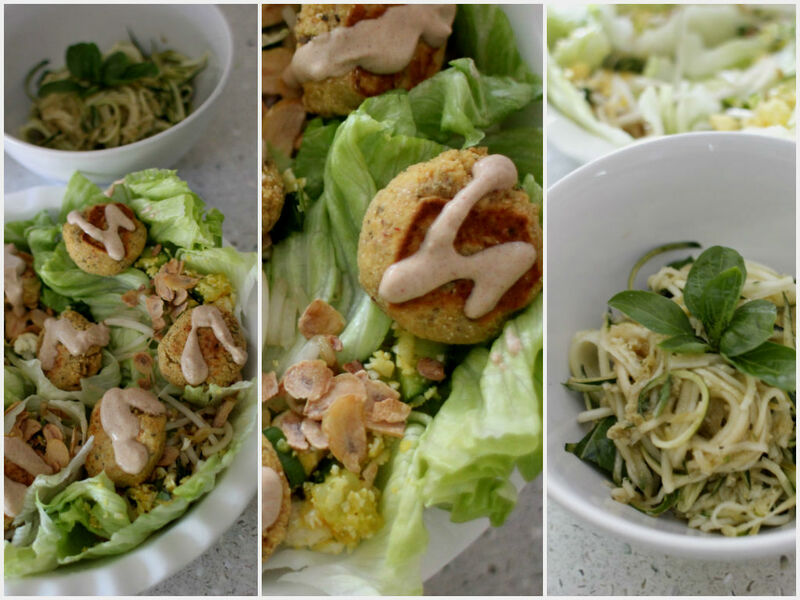 Place cooked falafels on top of lettuce cups and drizzle spicy tahini dressing. Mix all ingredients in a bowl. Whisk as you add warm water until you get a desired consistency. Taste and adjust seasoning.